There haven’t been a great number of quality American horror films in the past few years. Not that the genre has ever been particularly high-brow, but there seems to have been a more dire dearth in the past decade. Meanwhile, European horror, including French films like Inside [review here] and High Tension and the less effective Martyrs [review here] have taken center stage as far as the genre is concerned. For these reasons it is rather pleasant to see such a precise and measured retelling of a well-trodden story in an American horror movie. Director Ti West knows the history of the horror film, and crafts a remarkably effective pastiche of a time when horror was much simpler, more frightening, and not afraid of blood. Even the small things are properly honored, such as the opening titles suddenly freezing like many were in the 1970’s. Lovers of the genre, in particular, will appreciate these little touches. The story revolves around college student Samantha (Jocelin Donahue). She is fresh-faced, eager, and enthusiastic, but is about to discover the burdens of living on one’s own. An opening scene with an appearance by Dee Wallace has Sam looking at an apartment, one that would perfectly suit her. The down payment isn’t large, but still far beyond her current means. Searching for jobs she finds a flier asking for an emergency babysitter. Inquiring into the job she finds it a little creepier than she would like. The man on the other end blows her off, then begs for her to help him. She agrees to an interview, and takes her best friend Megan (Greta Gerwig) along. Driving out into the countryside they find an old mansion, and are greeted by a similarly aged man. Mr. Ulman (Tom Noonan) explains that he is in dire need. There is an event occurring at the full moon that requires the presence of him and his wife (Mary Woronov). The problem is that his mother is even older than he and needs someone in the house to ensure her safety and security. Sam is cautious, as is Megan, but the promise of enough money to pay her deposit and afford her some significant spending money sways her feelings. She agrees to spend the night there, in the house, alone with Mr. Ulman’s unseen mother. The setup is perfectly bland and generic, but done with enough aplomb to be convincing. The acting is subtle and effective and the camera work is slow and methodical, giving the impression that some crewmembers on the film had some experience in the industry. It is Sam’s night alone in the mansion that provides an incredible amount of suspense as the film turns into a haunted house story. Odd noises abound and Sam’s exploration of the house provides plenty of “don’t look in there” moments. Then there is a moment of unexpected bloodiness that is shocking and incredible, and sets the stage for the final third of the film. There is a slight letdown when the reveal is made, but the film impressively makes up for it with tight editing, frightening visuals, and an unrelenting pace reminiscent of the ferocity of Inside. The payoff isn’t terribly surprising, given the name of the film and an opening title that tells of the great Satanic panic that ensconced parts of the nation in the 1980’s. The film does a fine job poking amusing fun at the notion, while playing to its greatest fears. The mystery and the suspense in a film is almost always greater than the answer. As David Lynch might say, once the mysterious is revealed what’s left? Hitchcock knew that the bomb under the seat on the bus was far more suspenseful than the actual explosion. 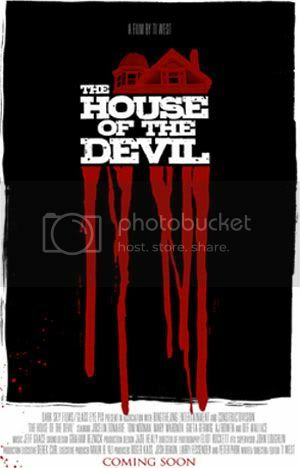 And so it is in House of the Devil; the first two thirds is frightening and atmospheric because the audience does not know the reasons behind what’s happening. Most movies collapse under their own weight once the reveal is made (this is a reason I often prefer films without a solid answer or reveal), unless the answer or reason is greater than the mystery or suspense. Happily, in House of the Devil the answer is nearly equal to the task, thus preventing a moment of enormous disappointment. House of the Devil stays true to its inspirations, and even includes a quick twist at the end in the vein of every horror movie ever made. The film is refreshingly chaste, but does allow for a large amount of blood in the final third. Moments are extremely bloody, but rarely disgustingly gory. The filmmaking is quite impressive, with long static shots reminiscent of Suspiria [review here]. House of the Devil is an admirable effort by a very young filmmaker, and grants a fresh breath of life into the American horror genre. This entry was posted in 3 stars, 3.5 pirate flags, H, Movie Reviews, Star Rating on August 23, 2010 by Tim Irwin.